Our room rate at Best Western Hotel Villa de Barajas included a very nice breakfast. Then a one-block walk took us to the metro station. 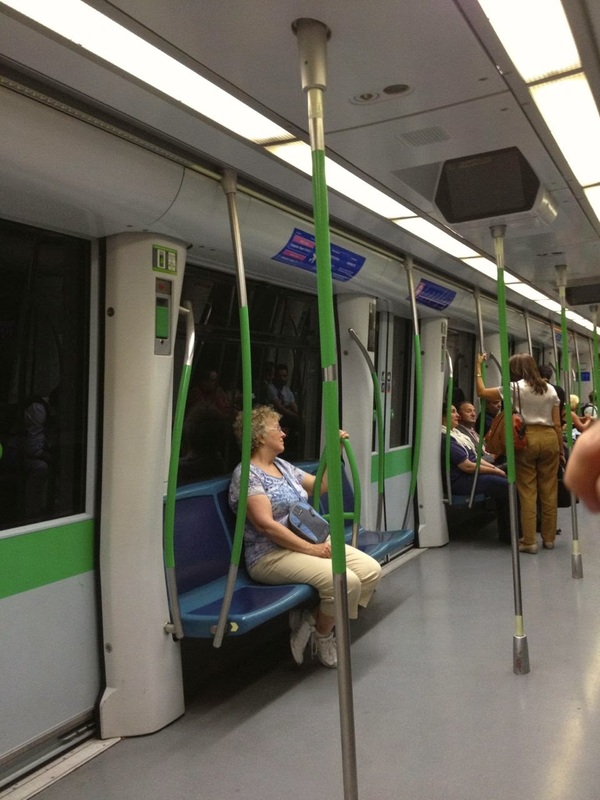 Our public-transit excursion involved two transfers, beginning with the modern Linea No. 8 from Barajas. Tourist Tip: I love to try the public transit in cities that we visit, but encourage caution (having been pick-pocketed twice in Paris). The Internet can scare you with warnings about thievery on Madrid's Metro, but we experienced no problems during our daytime round trip. 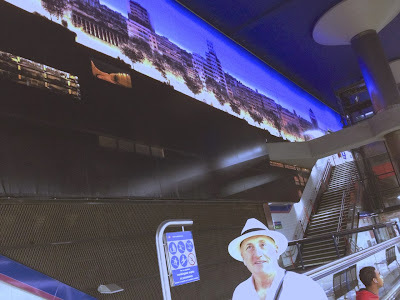 A surreal glow from George illuminates the Barajas metro station. Emerging from the underground at Gran Via, we were in familiar surroundings. 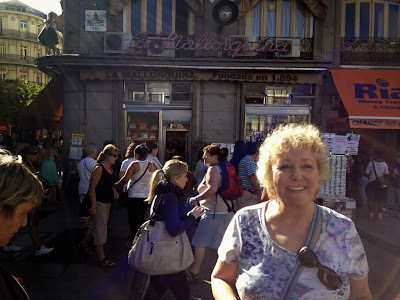 Just half a block from Apartmentos Caballero de Gracia that were our home for eight days in September! 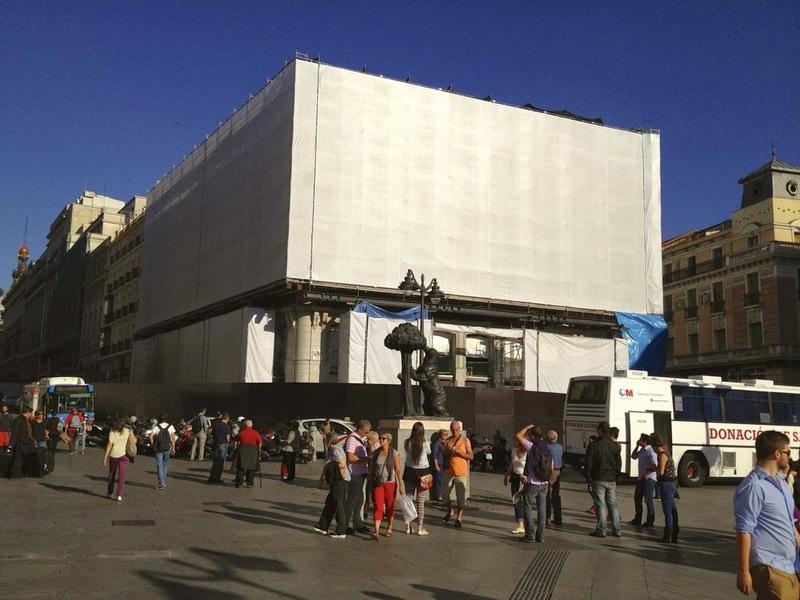 This is the gateway to Puerta del Sol. 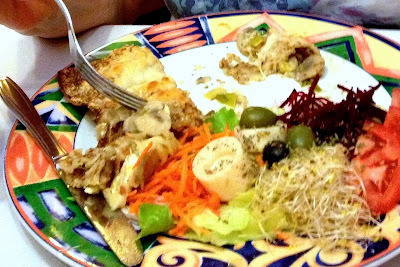 Gloria was determined to have lunch at Artemis II, a vegetarian place recommended by Rick Steves. Gloria's lunch was "Not too bad." OK, I'm not going to be kind here. I always go into these vegetarian places with low expectations. Let me just say that my four-cheese pizza did not disappoint. Gloria had a salad with some crusty thing that she says was "not too bad". But there is a food-enjoyment-recovery plan. Remember La Mallorquiña, the pastry shop in Puerta de Sol? Gloria has been scheming for two weeks to return for a Borracho. That pastry appears to be a mouth-watering caramel covered rum cake. Unfortunately it did not meet her expectations: first of all there was no rum; and its intense granular sweetness was more candified than she prefers. This large building surrounded by shrouded scaffolding is rumored to be … the future "World's Largest Apple Store". We stopped at a few shops, including the massive Corte de Ingles, and then it was time to take the metro back to Barajas. Everyone is afraid to sit next to Gloria on the Metro.